As a child, I loved to make my parents breakfast in bed. I thought there was something so special about that breakfast tray — laden with bacon, eggs and pancakes. 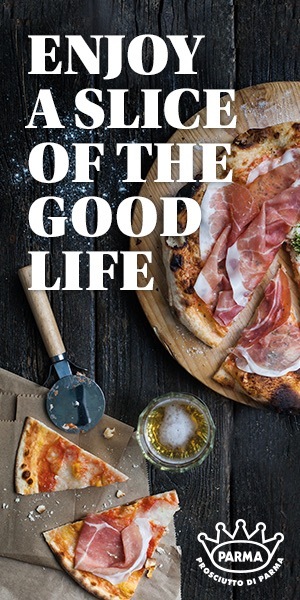 With cloth napkins tucked under the plates, a fresh pot of coffee and small glasses of juice. It seemed very fancy to me and a way to do something thoughtful for them. 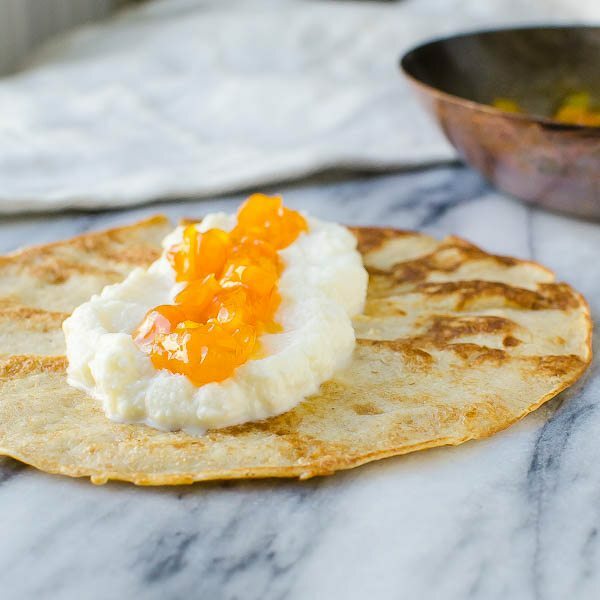 Mother’s Day demands the same kind of careful attention and maybe something a little different… Whole Wheat Apricot Ricotta Crepes. 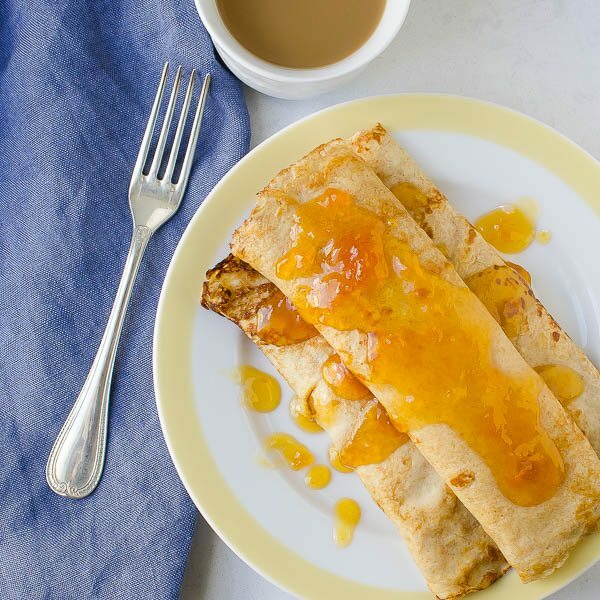 If crepes don’t seem like they’re all that unique to you, let me tell you why I like these… First, they’re made with whole wheat flour which (in my mind) makes them healthier and heartier. 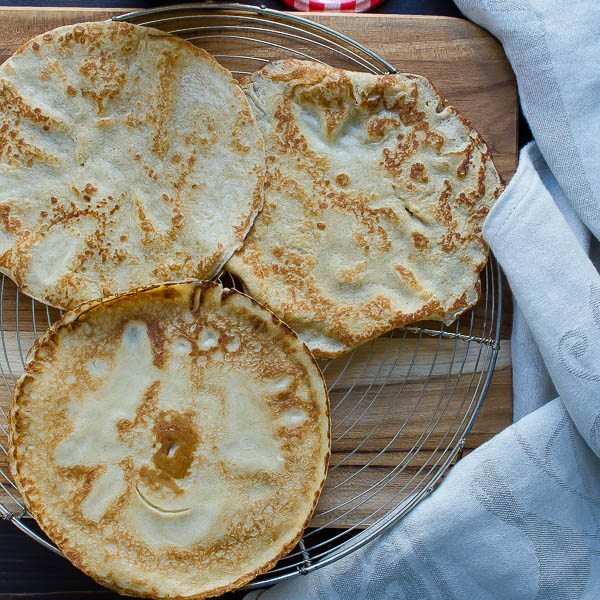 Second, the crepes can be made the day before — either up to the point of the batter — or cooked and stored — ready to fill. 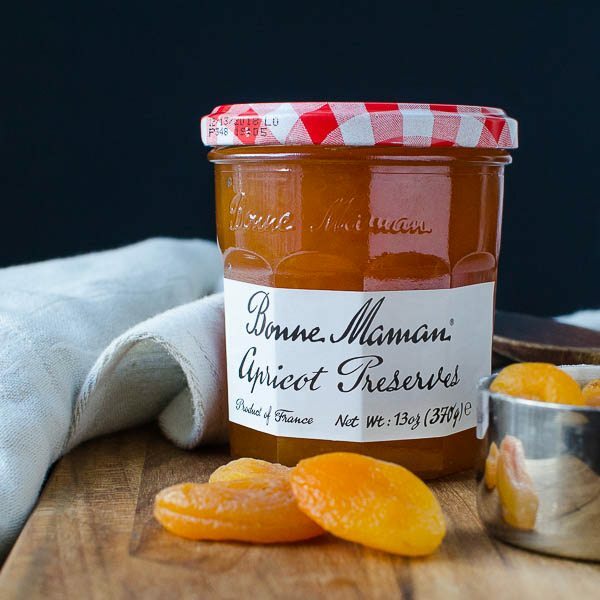 Finally, this recipe with a blend of Bonne Maman Apricot preserves and cognac is as close to heaven as you can get without actually, you know — going there. 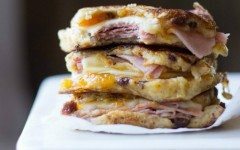 Bonne Maman is made from time-honored traditional French recipes. Their preserves and jellies are made with natural ingredients and feature the finest quality fruit. They are Non-GMO Project Verified, have no high fructose corn syrup, no artificial coloring or no preservatives added. I knew they were my favorite jams and jellies for a reason! 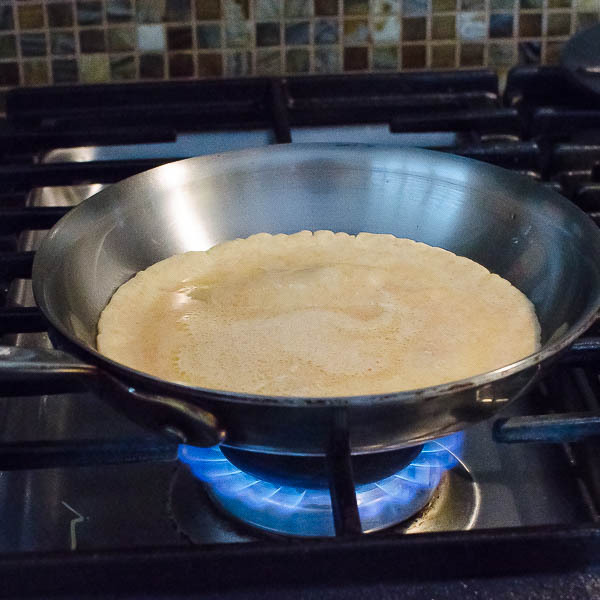 Many people prefer to cook crepes in a non-stick skillet or a real crepe pan (I don’t have one), but I used a small stainless steel skillet — sprayed liberally with nonstick spray and the crepes came out beautifully. 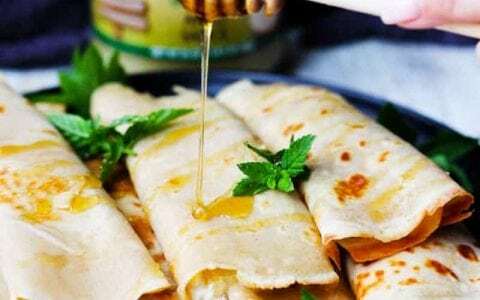 The trickiest part is flipping them, but I found that by holding a corner of a crepe between my thumb and forefinger and sliding the spatula underneath with the other hand, they flipped perfectly every time — even the first one, which is usually regarded as the throw-away crepe (or taster for the chef). Next is the filling – which is pretty simple to make and sublime to eat! 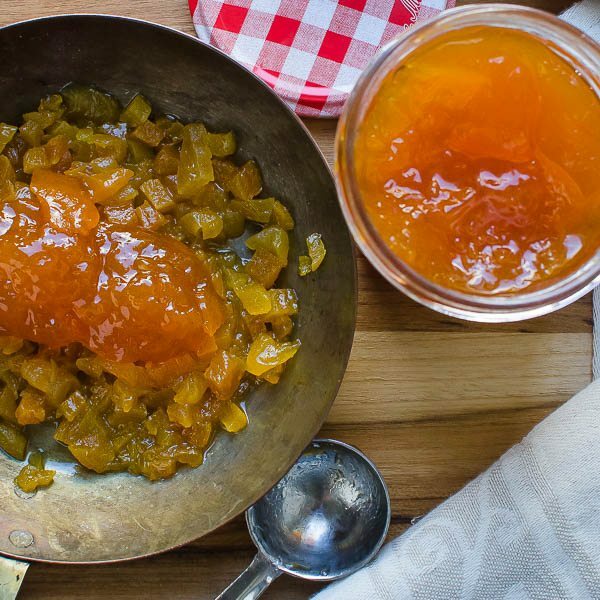 It starts with dried apricots and Bonne Maman Apricot Preserves – a favorite of mine all my life. 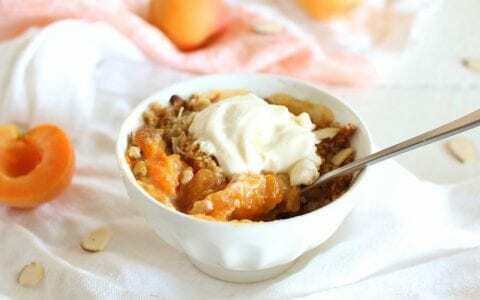 Dice the apricots and simmer them in a mix of butter, water and cognac (Mmmm, cognac), then stir in the preserves to make a sweet-tart filling. You can make this a day ahead and refrigerate it until you’re ready to assemble. For the filling, mix a container of ricotta cheese (I used fat free) with honey and lemon zest. I could have eaten this with a spoon it was so good — and yes, you can make it a day ahead so instead of cooking all morning, you’re really just assembling your Mother’s Day breakfast in bed. In a blender or using a medium bowl with a whisk, combine the flour, milk, water, eggs, butter, sugar and salt. 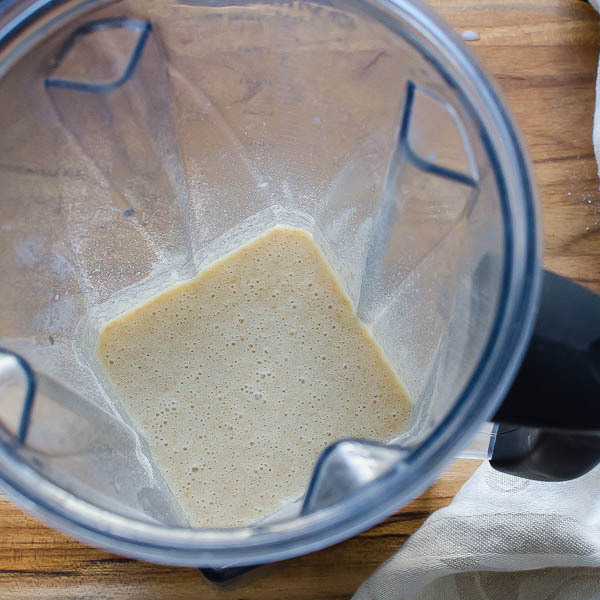 Blend or whisk until well combined and let rest for 30 minutes or cover and refrigerate for up to two days. (This allows the flour to absorb the liquid and for the gluten to relax. 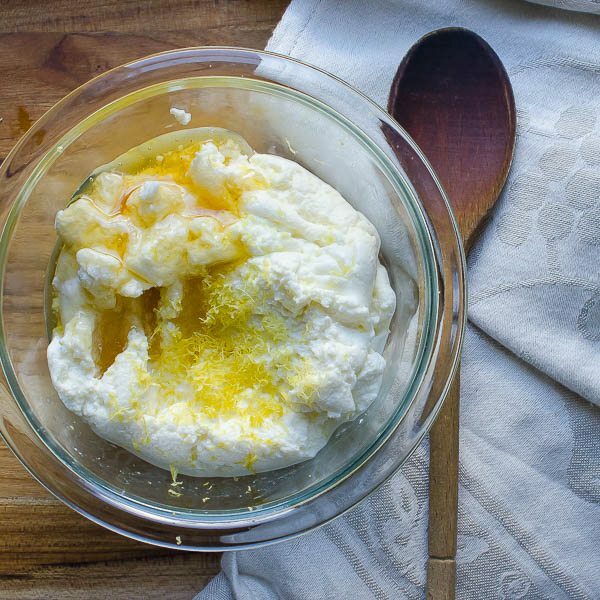 In a small bowl combine the ricotta, lemon zest and honey. Stir to combine and refrigerate until ready to assemble. In a small saucepan combine the diced apricots and water. Heat over medium heat and simmer (stirring constantly) until apricots are softened and water is half evaporated, about 5 minutes. 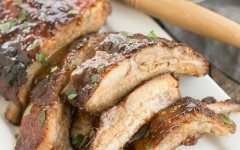 Stir in the butter and apricot preserves and heat through until preserves are melted. Stir in 2 tablespoons brandy/cognac and cook for 1-2 minutes. Taste -- to see if it needs more brandy/cognac and add as necessary. (Brandy/cognac shouldn't be a dominant flavor, but rather an enhancer.) Set Aside. Add apricot preserves to a small bowl and microwave for 1 minute or until liquid-y. Add the brandy/cognac and stir to combine. Set aside. 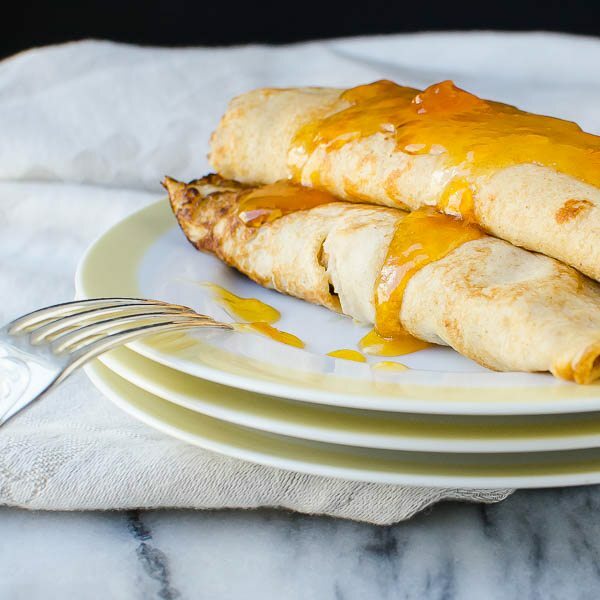 Lay a crepe on a flat surface. 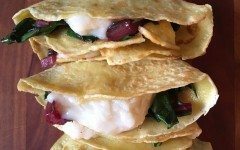 Add 2 tablespoons of ricotta filling in a line down the center of the crepe. Top with a few teaspoons Apricot Filling. 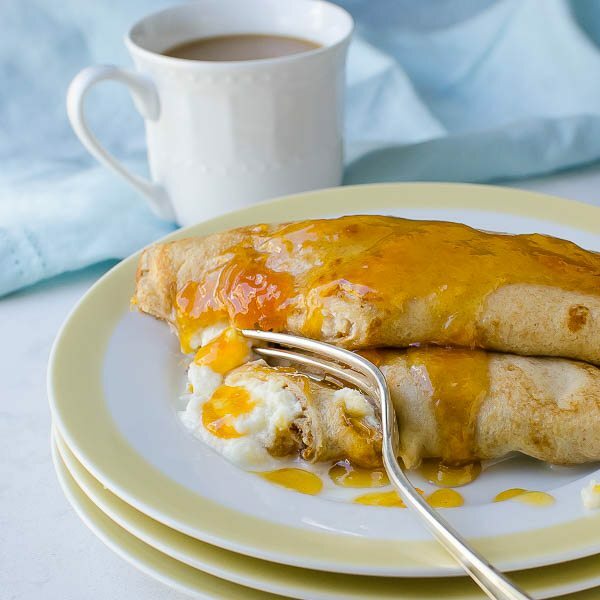 Roll the crepe around the filling and serve with a few teaspoons of Apricot Glaze. Dish looks so yummy and tasty. I want to make it today only. Thanks dear lista for the recipe.